Jalapeño Peppers: Lean In... Or Lean Out? Part 3. Lean In... Or Lean Out? Part 3. Following Part 1 and Part 2, which were mostly on highlights of Sheryl Sandberg's book Lean In: Women, Work, and the Will to Lead, here is Part 3... some of it, at least. I couldn't fit it all in one post. I choked a bit on some of the ideas in these chapters, so I'll try to represent her line of thinking as fairly as possible before coming in with a sledgehammer offering my own criticisms. Sandberg's main argument here is that many women begin preparing for the eventual arrival of a baby months and even years before the birth, and some of that preparation involves scaling back on a high-powered career path. Women who are anticipating having a child tend to let opportunities and promotions pass them by because they think they will not be able to keep up the same pace after the baby is born. But later, when those women finally do return to the workplace, Sandberg says, they are "likely to feel less fulfilled, underutilized, or unappreciated" because they have "fallen behind" in their career path and are probably working for someone with less experience. Then, because work is less satisfying and challenging, they may end up leaving their job altogether. For Sandberg, it is a sad irony that women's attempts to save their career (by scaling back) actually end up demolishing it, since they find themselves too frustrated with the view from the slow lane. Sandberg thus offers a "counter-intuitive" proposal: instead of pulling back, she says, women should "lean in" and go full force on their careers, accepting every promotion and maintaining maximum intensity until the child is born. This recommendation is based on her belief that it is possible to combine a high-powered career with the demands of motherhood, although she also includes a caveat that "given life's variables," she would never recommend that every woman do so under all circumstances. To be fair to Sandberg, she is not saying that all women need to put career first, baby second. That would be an oversimplification. Instead, she is urging women who are deeply dedicated to high-level careers not to assume that it can't be done, and to open their minds to the possibility of finding creative ways to combine both roles. But here's where things get hairy. "Only a compelling, challenging, and rewarding job will begin to make that choice [to leave a child in someone else's care] a fair contest," she writes. There is no mention here of economic necessity, which often forces women to make difficult but necessary choices. The choice Sandberg is presenting is about a woman's professional fulfillment, which she seems to believe is the most important value in the equation. This recommendation strikes me as self-centered. Yes, babies are too little to have a voice, but that doesn't mean they lack the capacity to feel their mother's absence. They aren't gerbils; they're human beings. Yet, Sandberg seems to reduce "primary care" to the essentials of providing basic necessities: food, clothing, shelter, or even education. I do not and cannot conceive of motherhood in such a reductive way. Children are not just small animals that need to be fed, watered, and taken outside for walks. They are little souls that live and grow on love, and whether women like it or not, children crave and need their mother's love. Mothering is not just a question of a "biological imperative" that can be overcome with a few handy modern inventions and a fistful of feminist ideology. Mothering has a psychological and spiritual element to it as well. No breast pump, no matter how sophisticated, can replace the daily gift of the heart through the multitude of tiny gestures and actions that motherhood is made of, and that a child can only experience when his mother is actually there to give them, at least during a significant part of the day. Sandberg justifies high-powered career women who are never home by saying that "they love their kids" and that those kids "turn out just fine." I don't doubt that those women feel love for their children, and I also don't doubt that many of those children eventually grow up to be successful professionals in their own right. But there is so much assumption going on, and perhaps some projection of our need for it to all "be fine." We can't get inside the mind of a baby or a very young child to know how they experience their mother's absence, so how sure can we be that it's all fine? We may have a hundred things going on in our lives, but a baby's central focus is his mother. If she is missing almost all of the time, what must that feel like? How can we know? Wisdom from the Ting Tings. Which brings me to my second criticism: it's one thing to feel love for a child, but it's quite another to make that child experience it in a real way. Like the Ting Tings sing, "It's not just what you're thinking of, it's what you put across." And the words and actions that communicate that love, that make it present and real, don't take place in a vacuum. You have to be present to communicate love. Emails, phone calls, and gifts can be a temporary bridge. But they cannot be the substance that motherhood is made of. I don't think women need to be home all the time in order to communicate that love. I do think some degree of work/career and motherhood is compatible. And I have a vested interest in believing so, since I also work and Olivia goes to pre-K for four hours every day. So far, so good: her day is anchored by my presence in the morning and in the early afternoon when she comes home. So I'm not an advocate of keeping kids home all day, or of chaining moms to the kitchen. I could never homeschool because I don't have the patience for it. I, and many other women, need to get out and do other things that stimulate us and help us grow. Happy moms make for happy kids (and better marriages), and it's good for kids to experience other caregivers besides just mom. So I don't subscribe to the idea that women can't work or ever be away from home. Nonsense. My issue is just with where we draw the line in terms of hours of absence. Some temporary separation seems healthy to me, and having little ones spend time with relatives and teachers is good for them. But if the majority of their time is spent away from home and they see mom only for five minutes before they go to bed and as the family is rushing to get ready in the morning, then something is wrong. I have heard of one too many cases of children who get shuttled from day care to babysitter while their parents are out doing other things all day and all evening, and I can't help feeling a terrible sadness for those little ones. What did they do to deserve such neglect? What conclusions must they draw as they grow about how lovable they are in their parents' eyes? And why did those parents ever have a child in the first place when they could have bought a nice little gerbil or a goldfish? On this point of exportable motherhood, my response to Sandberg boils down to this: you are encouraging women to think of what is best for them as a professionals, but you are minimizing the question of what is best for the children. "Child care" is not just the provision of basic necessities; it is the daily gift of love, and if that is lacking, then we are being incredibly irresponsible with the lives entrusted to our care. 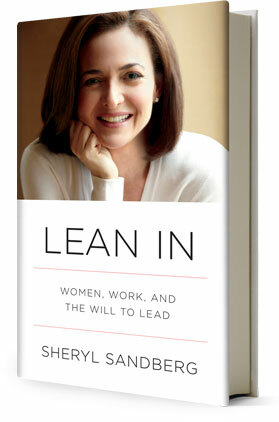 In this chapter, Sandberg argues that "as women must be more empowered at work, men must be more empowered at home." In other words, men need to be given an active role in the family, not sidelined to be just providers and observers. Men bring gifts to parenting that women don't have, both because of personality and because of differences in masculine and feminine psychology. I think children benefit from the balance of a woman's more nurturing approach and a father's more rough-and-tumble, crazy play approach, or a woman's empathy and a father's objectivity, or whatever the balance happens to be when personality and particular differences are taken into account. So, no problems with this chapter. Here, Sandberg points out the obvious fact that women can't "do it all," simply because time is a limited commodity and we need sleep. She points to the example of her sister-in-law, a doctor, who worked 12-hour days while also trying to pump for her newborn infant. Since she "wanted to feel connected to my baby in the limited hours that I was home," she made herself the sole caregiver most nights. Basically, she never slept. With her second child, she got wiser and took 3 months off, adjusting her schedule upon her return. Her sister-in-law discovered that despite her previous fears, reducing her hours did not affect her reputation or productivity. Sandberg gives this and similar examples as proof that women can negotiate a more realistic work-family schedule even on the fast track. But shortly afterwards, she admits that her sister-in-law's successful negotiation was more of an exception than the rule, since "employees who make use of flexible work policies are often penalized and seen as less committed than their peers." So that's a buzz kill. It worked for her sister-in-law, but it doesn't work for most people. So... good luck as you hit the accelerator, ladies. Hope it "all works out" for you. May the odds be ever in your favor. This is actually one of the consistent flaws -- or maybe just realities -- of Sandberg's approach: there really is no tried and true method. Each case is so different, and her own story is riddled with exceptions to the rule. Some critics have accused her of offering contradictory and inconsistent advice because her own experience so often belies the very steps she recommends. But I think this is just one of the realities of the elusive work-family balance issue. We keep talking about it because there is no clear-cut, one-size-fits-all answer. Each woman has to figure out a creative way to balance these two aspects (if necessary) in the context of her own marriage and family and line of work, not to mention the workplace culture. So many variables... no wonder there is no simple formula for success! On another note, this chapter also offers a rebuttal to women who advocate staying home full-time and being intensely involved in the lives of their children. Women who stay at home in order to care exclusively for their children are part of a new trend that sociologists call "intensive mothering." Past models of mothering were a little more laissez-faire, with moms present but not always directly involved in their children's games and play. Today, many moms (self included, up to the point that my laziness permits) are trying so hard to be good moms that they quite possibly devolve into helicopter moms, always hovering, always swooping in to fix things. I know in theory that there is a balance between being involved and giving space, but I have trouble finding it in practice. So yes, I'm probably one of those. And as hyper-involved moms, we tend to believe that more time with our kids = greater benefits for them. But Sandberg cites a series of studies that argue against that assumption. In summary, the studies claim that "children who were cared for exclusively by their mothers did not develop differently than those who were also cared for by others." This strikes me as pretty obvious: it takes a village to raise a child, right? Hence the value of extended family, networks of friends, teachers, coaches, and so on. But what neither the study nor Sandberg specifies is how the children's time was distributed between their mothers and others. I would be interested to see what kind of proportion we're talking about here. Where is the optimal distribution of "time with Mommy" and "time with others"? At how many hours a day does Mommy's absence become detrimental? How many hours of intensive presence are optimal? Let's quantify this mother love thing, shall we? I want to see percentages, pie charts, and graphs with two colored lines intersecting at the point of optimization so that I can plan my mothering the way I plan my finances. And of course, that ain't gonna happen because each child is so unique and each relationship is also a singular, daily creation. So I know it's unreal to hope for any kind of hard data on the matter. But still, I imagine there is some kind of a basic bell curve -- too much time with Mommy is probably limiting (especially if she's pregnant and tired and has to play games like, "Why don't I lay here on the couch while you make Thomas the Train go in circles around the living room? Vroom! Vroom!") while too little time is virtual orphanhood. But somewhere in the middle there is an optimal mix of Mommy-care and other-care, and I'd like to find that balance in my own life and family. It will probably be by trial and error, and I'll probably err on the side of being around too much. Speaking of too much... I have to continue the next part in another post, since this is getting too long and I'm sleep deprived and dealing with a fuzzy brain today. Hopefully I'll get the next part out before the baby is born! Good luck to all you fabulous moms. I know we are all doing the best we can!